This topic comes up frequently during consultations with couples. What is a first look? Traditionally, the couple would not see each other on the wedding day until the processional at the beginning of their ceremony. 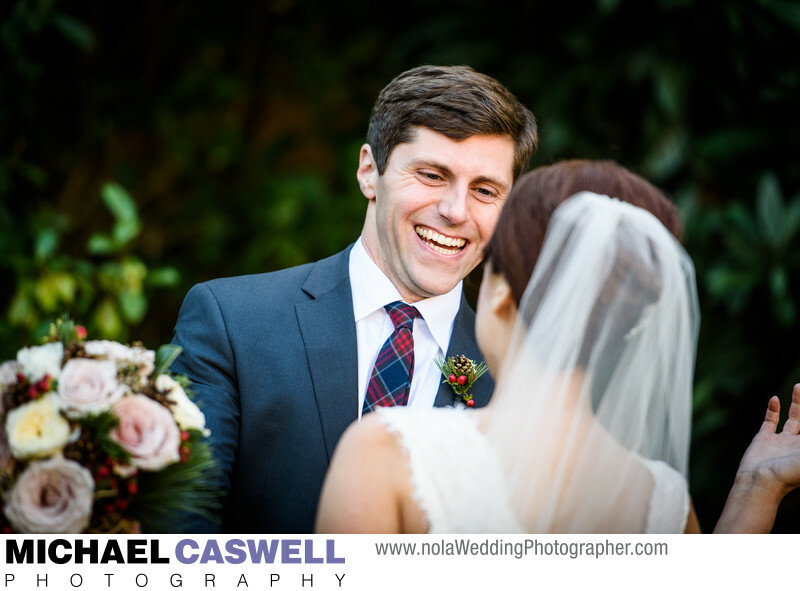 But in recent years, an increasing number of couples are choosing to see each other before the ceremony in a portion of the wedding day known as a first look, first glance, or reveal, which usually consists of just the couple (and their photographer!). While first looks were fairly uncommon 10 years ago, I'd estimate that well over half of my couples currently choose to see each other before the ceremony. When discussing this with my clients, I am happy to offer my advice and give the pros and cons, but in the end it is a decision that the couple needs to be comfortable with either way. In sitting in on some of these conversations that couples have regarding the first look, perhaps ironically, I’ve noticed that if anyone is hesitant, it’s usually the groom. Though it’s easy to think that the bride is the only one who has certain preconceived visions of how she wants the wedding day to go, sometimes guys really want to wait until the ceremony to see their bride. And if the groom does indeed feel very strongly about it, you should try very hard to structure your wedding day plans to accommodate this wish. What are the good things about doing a first look? Though it is often done for the benefit of enabling you to get all of the formal group shots done before the ceremony (which then means you can go straight to the reception without delay), the reveal itself provides an opportunity to capture some beautiful photographs of this special moment in a more intimate setting than the ceremony itself would allow, and gives us more time for portraits of the couple. This can be particularly important for weddings where it will be dark outside after the ceremony, which would preclude us from being able to get pleasing natural light portraits of the couple outside unless they were done beforehand. This is often the case for weddings that take place in the Fall and Winter, since it gets dark so early during this time of year. Aside from the logistical reasons, it can also help significantly ease the pre-ceremony tension and nervousness, which is important for some couples. At a recent wedding I photographed, the bride was very anxious about wanting to see her groom, and was worried about crying (which would have affected her makeup) while coming down the aisle. Having a first look completely put her at ease, helping her relax and be able to fully enjoy the ceremony. How about the down sides to the first look? It can sometimes be challenging to find an appropriate area to use at some venues. If it's taking place during daytime, I have a strong preference for an outdoor location. 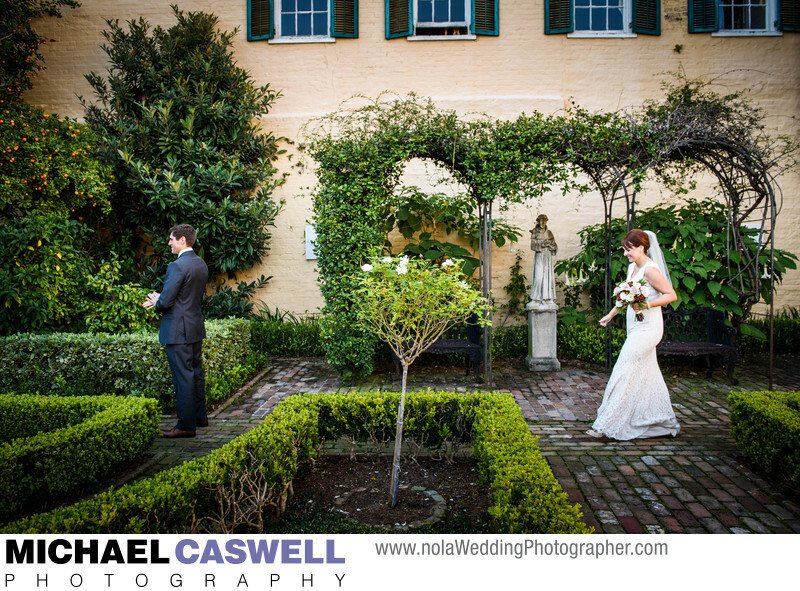 If the ceremony is taking place in a courtyard, this can be a good spot, though some coordination is required with the venue staff and florist to ensure the area will be set up in time or that they can take a brief break to give us the use of the courtyard for a few minutes. Often a hotel may have a smaller and more private garden or courtyard area which can be used. But be aware, some event venues may not allow access until an hour or so before the ceremony, which may limit our ability to do the first look there, since typically we'd want to start with the first look about two hours before if we are planning to do formal group shots then as well. Also, there can be some transportation issues, particularly if the reveal is to take place somewhere other than where the bride and groom are getting ready, because you both need to brought to this location separately, and without inadvertently running into each other. Another possible concern is that, in order to fully take advantage of the benefits of the first look (by doing most or all of the formal group shots before the ceremony), wedding party and family members will need to be fully dressed and ready earlier. Lastly, you will likely need more photographic coverage time than you otherwise would (at least an hour more, possibly two, depending on how much time you want to devote to portraits, and also setting aside a half hour or so before the ceremony to just relax for a bit before it begins and so the bride can be hidden away before guests arrive in large numbers). But that extra hour or two of coverage essentially buys you more time to enjoy your reception (or cocktail hour if you are having one) and spend quality time with your guests, since you will not have to do post-ceremony group photographs, and also allows for more portrait time with just the two of you, again without cutting into your reception time. In conclusion, if both of you (particularly the groom) are open to the idea, I definitely recommend having a first look!